Find out what our experts have to say about TVS Apache RTR 160! TVS launched the Apache RTR 160 4V in March 2018 and it only took 6 months for the bike to touch the 1 lakh sales mark. The RTR 160 4V was a major upgrade from its predecessor, the RTR 160 2V, both in terms of design and dynamics. The design is highly inspired by its elder sibling, the RTR 200, featuring a sleek headlamp, mass-forward muscular fuel tank, LED tail light, and double-barrel exhaust. Powering the RTR 160 4V is a 159.7cc single-cylinder, air-cooled engine with oil cooler, which generates a max power of 16.8PS (Fuel-Injected) at 8000rpm and a peak torque of 14.8Nm at 6500rpm. The carburetted model generates 0.3PS lesser power. The RTR 160 4V is offered in three variants - the Carburetor Single Disc at Rs 82,810, the Carburetor Dual Disc at Rs 85,810 and the Fi Dual Disc at Rs 91,810 (all prices ex-showroom Delhi). One can choose from three colour options - red, black, and blue. It competes against the likes of the Suzuki Gixxer, the Honda CB Hornet 160R, and the Yamaha FZ-S FI. The least priced variant is TVS Apache RTR 160 4V Carburetor Single Disc priced at Rs. 98,147 and the most priced variant is TVS Apache RTR 160 4V Fi ABS priced at Rs. 1,14,761. Choose the TVS Apache RTR 160 which fits the bill of you. Since its inception, the TVS Apache has been a fans' motorcycle in the Indian sports bike segment. The first model in the series was introduced in 2015 in the form of the TVS Apache 150 IE-Surge. 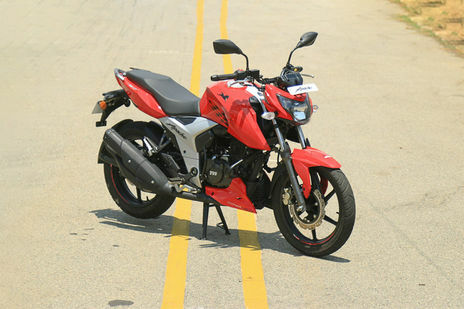 The motorcycle entered the 150cc segment which was highly dominated by the Bajaj Pulsar. However, the sporty styling of the motorcycle grabbed attention from the Indian enthusiasts and it became a hit in the market. Later, the company introduced its 160cc model, followed by the addition of RTR (Race Throttle Response) technology. The latest generation of the model is TVS Apache RTR 160 4V which was introduced in the market in March 2018. Besides a complete makeover, the model received a host of technical updates including a new four-valve engine. In terms of design, the TVS Apache RTR 160 4V mimics its elder sibling – the Apache RTR 200 4V. The bike gets aggressive streetfighter styling with a low-slung headlamp and masculine fuel tank with plastic cladding. The headlamp also features twin LED positioning lamps and the motorcycle gets an LED tail lamp too. It features a contoured seat with sleek rear panels and a bat-wing styled rear grab rail. The bike comes with an all-black theme with black finished engine, wheels, front fork outer tubes, swing arm, rear tyre hugger and the sporty double-barrel exhaust muffler. The side panels are painted silver, providing a dual tone finish to the Apache RTR 160 4V which comes in three colour options – RR Red, Racing Black, and Racing Blue. All the colour options come with sporty chequered flag graphics and a 3D brand logo. The motorcycle gets six-spoke alloy wheels with sporty pinstripes and an LCD digital instrument cluster. If we talk about the dimensions, the RTR 160 4V has a wheelbase of 1,357mm. It measures 2,050mm, 790mm and 1,050mm in length, width and height respectively. Powering the latest generation Apache RTR 160 4V is a 159.7cc, single-cylinder, air-cooled engine, which the company says, has been borrowed from their Indian National Motorcycle Racing Championship (INMRC) winning race machine. The motor gets advanced four-valve configuration and an oil-cooler for better output and long-run performance. It comes with both carburetor and fuel injection tyre fuel system options, offering a power output of 16.5PS and 16.8PS respectively at 8,000rpm. The engine comes mated to a five-speed gearbox via a wet multi-plate clutch assembly and delivers a peak torque 14.8Nm at 6,000rpm. TVS claims that the carburettor variant of the Apache RTR 160 4V can do a 0-60kmph sprint in just 4.73 seconds and a 0-100kmph in 15.9 seconds. The variant has a top speed of 113kmph while that of the EFI version is 114kmph. The company claims that the motorcycle returns a fuel efficiency of up to 60kmpl. The TVS Apache RTR 160 4V is based on a race-derived double cradle split Synchro Stiff chassis, engineered using Multi-Body Dynamics Analysis. The company says that it provides the bike with an optimized vehicle layout, increasing the stability by 25 percent. The front of the motorcycle comes suspended on telescopic front forks and race-tuned Showa monoshock suspension at the rear. The RTR 160 4V has a decent seat height of 800mm which is quite adequate for an average Indian rider. Still, it features a ground clearance of 180mm for hassle-free ride experience on uneven roads. The bike runs on 17-inch wheels and the front wheel gets a 270mm petal disc brake as standard which works well with the suspension setup. The rear wheel gets a 130mm drum brake as standard while TVS also offers a 200mm petal disc brake for the rear as an optional extra. The front and rear wheels come shod with a 90/90-17 49P and 110/80-17 57P tubeless tyres respectively. In the rear disc brake variant, the rear tyre gets a wider 130/70-17 M/C 62P tubeless tyre for better grip as well as masculine appearance. In terms of safety, the Apache RTR 160 4V comes with always-on LED positioning lights and a front disc brake as standard. The company also offers a rear petal disc brake for better stopping power. The bike comes with TVS Remora tyres which are claimed offering better grip while one can also opt for high-performance Pirelli tyre for assured confidence. It also gets an advanced pass switch that works in reverse function when the headlamp remains in high beam. The motorcycle comes with features like oil-cooling, electronic fuel injection system (optional) and a fully digital instrument cluster. Besides the basic features like speedometer, odometer, trip meters, fuel gauge and tachometer, the LCD console offers race diagnostic features like lap timer, 0-60 timer, top speed recorder, etc.